The SQA Advanced Diploma in Hospitality Management (SCQF level 8) develops the management, supervisory and interpersonal skills required for employment in the hospitality industry. It covers management of accommodation, accounting, human resource management, management of hospitality organisations, and management of food and beverage operations. Students will also gain an understanding of the structure and organisation of the industry, and its influence on the economy. Typically an SQA Advanced Diploma takes two years to complete. 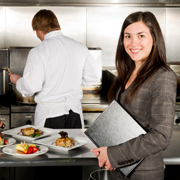 The SQA Advanced Diploma in Hospitality Management can provide advanced entry to degree-level study. For further information please refer to the SQA university agreements. This SQA Advanced Diploma in Hospitality Management consists of 15 mandatory units (176 SCQF credit points) and limited option sections which contribute a minimum of 16 SCQF points. A further 24–64 SCQF points are required from the optional unit groupings, depending on the units selected in the limited option groupings. For information on the structure of this qualification, please refer to the arrangements document.